According to Dictionary.com, Web 2.0 refers to a new generation of internet usage where the internet is a medium for interacting with the web. Examples of this range from posting comments in a forum, to being a member of a social network site, to creating presentations in print, visual, or video format to be viewed by the public or a private group. Dynamic Elements. The website is constantly changing and being updated automatically through RSS feeds, calendars, and other features. Social Elements. People are able to interact and add their own ideas through blogs, micro-blogs, and discussion areas. They can also easily share posts with others. Participatory Elements. Users can participate by rating articles, adding comments, and incorporating their own sightings and data. Everyone! Both teachers and students can benefit from using these tools whether it be for organizing, sharing, or creating. 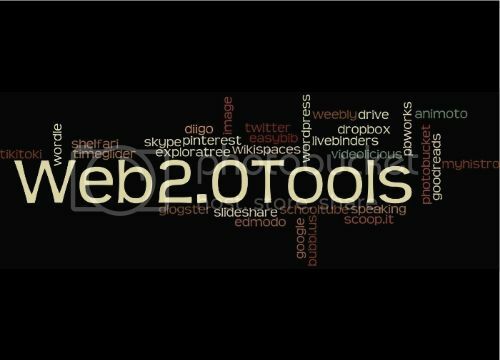 Check out some great Web 2.0 tools by hovering over “Web 2.0 Tools” in the top menu bar and clicking on your choice! Lamb, Annette, and Larry Johnson. “Technology Swarms for Digital Learners.” Teacher Librarian 1 June 2012: 67-71. Print. “Web 2.0.” Dictionary.com. Dictionary.com, n.d. Web. 10 Dec. 2012. Do you have a recommendation you would like us to add? Let us know below. Scoop.it allows you to create your own newsfeed for free (paid plans are available). You can grab the bookmarklet or the apps and when you read an article/page of interest, you can add it to your feed and also share it on Facebook, Twitter, and LinkedIn (your choice each post). Much like a build-it-yourself version of Zite as it will also suggest items for your feed based on the keywords you provide. It gets content from Google Blogs, Twitter, YouTube, and other Scoop.It feeds.